Galley Wench Tales: Bang! Splash! S---! Again!?! in shallow waters, especially when it comes to anchoring. Winds were 20+ knots in our face as we entered the remote atoll (island) reef girded pass opening into Suwarrow. Suwarrow’s anchorage area was densely strewn, polka-dotted, with dark coral heads – “bommies.” Depths ranged from a reasonable 10 meters (30’) to a lot deeper than we’d want to dive to unwedge our chain if coral-caught. The seven boats already anchored were closely clustered in the 10 meter areas. Due to the wind, there was a lot of chop, hobby-horsing (rocking) our boat in a jerky motion from fore to aft. 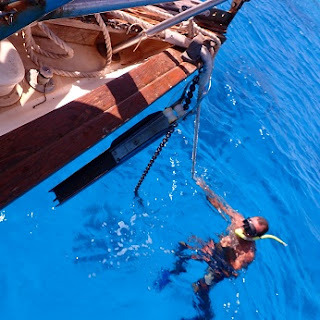 That, the coral, the tight anchorage and (our past disaster with our bow anchor roller platform) makes anchoring and taking off from anchoring particularly stressful. Plus, we’d just spent the last six days sailing, 24/7, 660 nautical miles from Maupiti, French Polynesia to Suwarrow, Cook Islands. We were tired and more than ready for some R&R. Wayne found a good anchoring spot, positioned our boat into the wind and gave me the word to drop anchor. “We’re too close to Firefly. Bring it up,” Capt. Wayne requested. It’s best to stay at least a couple of boat lengths away from other boats in an anchorage, as wind and waves shift boats’ positions. Worse, in high winds, sometimes boats may “drag,” moving as their anchor unseats itself underwater. Our bow anchor roller exploded off our boat, rapidly descending into the water. Not a pretty sight. Our bow anchor roller said bye-bye in a dramatic way -- again! “S---! Wayne! Our anchor roller platform’s gone! I swear it wasn’t my fault!” I exclaimed. 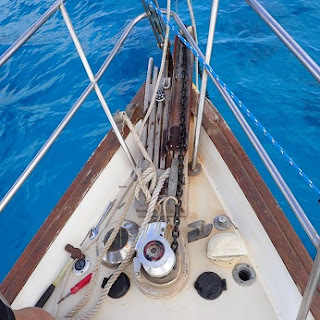 Ever since our last anchoring disaster, clearly my fault, I’ve struggled to improve my technique whilst we deal with challenging conditions and changing anchor roller setups. Who likes to be the cause of dangerous and expensive boat problems? Certainly not me! Yet I have. All it takes is a split second of stupidity and the damage is done. And more times than I care to admit, I am guilty as charged, and admit it, albeit reluctantly. This time, though, it was simply circumstantial. At least I believe so. Quickly, Wayne came to the bow to figure out what to do, while I took over the helm. Wayne rigged up a temporary line to hold us where we were. Did I mention Suwarrow’s anchorage area is rife with sharks? Adventurous as we are, we are among those who do not normally relish swimming with sharks. 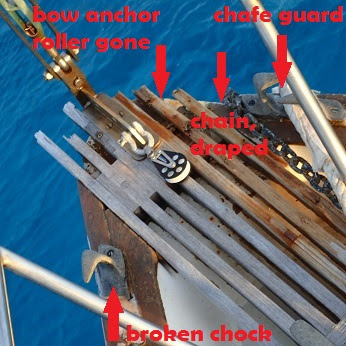 “At least this time the anchor roller is still attached to our chain. It should just be there, I can just follow our chain right down to it” he added, more optimistically. 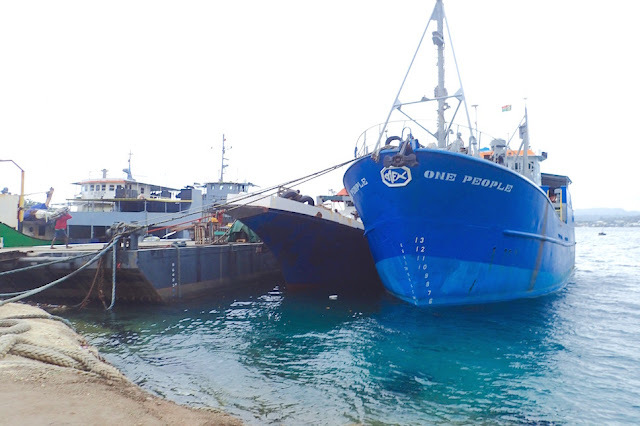 “And the water this time is clear, unlike the muck in Hiva Oa [last time we had an issue]. Do you have everything here to fix it?” I asked. Drew of Firefly hands up our heavy bow roller, which he retrieved. We were a bit closer to Firefly than before we attempted re-anchoring. Fortunately we know Drew and Shelly of Firefly well, and trust each other to work together and keep our boats safe. And our oversized Rocna anchor – if not our anchor platform – is very solid. “What, besides not spraying ourselves with WD40 [a fish oil as well as a lubricant] do we need to do for sharks not to be a problem while we retrieve our bow roller?” we mused, a bit nervously. The wind continued to blow hard. The water remained choppy. More boats arrived, making the anchorage more cozy…. We delayed some more…. “Knock. Knock.” It was late morning, our third day at Suwarrow. We were –ahem – busily engaged in adult activities aboard. Wayne hastily made himself presentable and exited our boat’s cabin. Temporary fix in place for our bow anchor roller, thanks to Wayne. 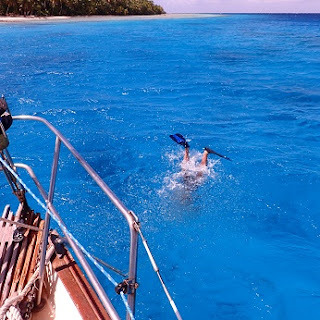 “Do you have a rope?” asked a finned, masked and snorkeled Drew. “I can free dive to 60 feet,” he’d volunteered the night before, when we discussed our as yet unaddressed sunken bow roller. 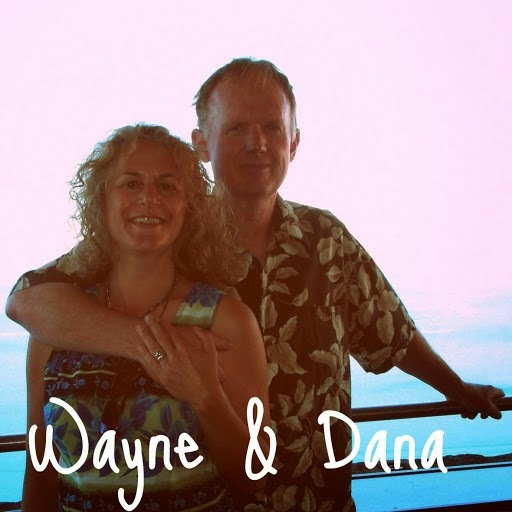 Wayne gave Drew some line, and with a smart tuck and flip of his flippers, lickety split, he surfaced, roller in his outstretched hand. Wayne promptly rope secured it, to hold it for bolting down later. And there weren’t even any sharks about, despite their many prior visits. Meanwhile, fingers crossed for the next three months or so until the entire bow platform area is rebuilt in New Zealand. far easier than dropping anchor was! 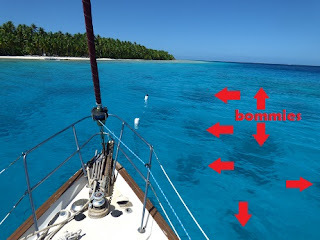 Our bow anchor roller broke and this post was written while we were in Suwarrow, Cook Islands (S13.14.907 W163.06.470). This blog put into blog format in Pago Pago, American Samoa (S14.16.472 W170.40.456), and pre-set to post while we're underway to Nuiataputapu (or "new potato" for the linguistically challenged) Tonga, our first stop in Tonga. Even in 24+ knot winds in Pago Pago, our anchoring system behaved. 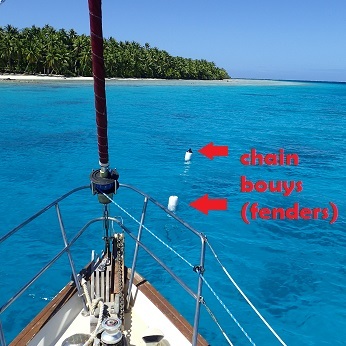 Fingers crossed it did so bringing up our anchor, exiting Pago Pago after a week and a half. Wifi is sparse in Tonga, which will affect blog post frequency off and on until New Zealand in November.